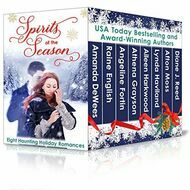 From Victorian England to the quaint and haunted inns of contemporary Vermont, Florida, and Savannah, Georgia; from a ski resort in Lake Tahoe to Japan’s snowy mountaintops and even a gypsy wagon, there’s no place the Spirits of the Season can’t find their way into a hero’s or a heroine’s heart. And yours, too! Upon a Ghostly Yule: A Victorian Christmas Short Story by Amanda DeWees, Daphne du Maurier Award–winning author of historical romantic suspense. When the ghost of a willful 18th-century beauty takes possession of spirited young Felicity Reginald at a Victorian Christmas house party, mystery and danger follow... but so does romance.